At Stanmer Secondary Modern school, one of the four “houses” was called Hepworth after the famous sculptress Barbara Hepworth. 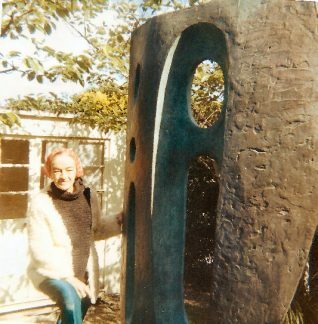 I was vice-captain of Hepworth & during the school trip to Cornwall in 1966 a trip was arranged to meet Barbara Hepworth at her home in St. Ives where she had some of her work in the gardens. Hepworth’s home is now a museum for her life and work. I have a clear memory of asking her if I could take a photo of her with one of her works. The photo you see here was the result. We all stayed in Newquay at an old Victorian hotel and I remember trips to the tin mines. I also remember getting separated from the main party. When reunited with them the formidable Miss Harvey gave me a hefty slap around the face. She certainly would not get away with that today.